This is my work desk as I join Julia at Stamping Ground today. Poor WOYWWendy looks like she's been imbibing a bit too much. My desk is filled with more lovely gifts from friends. This is NOT the "obligatory" rocking horse, but a lovely gift from my friend Debbie. On the right is one side of a beautiful tip-in from Dianne. 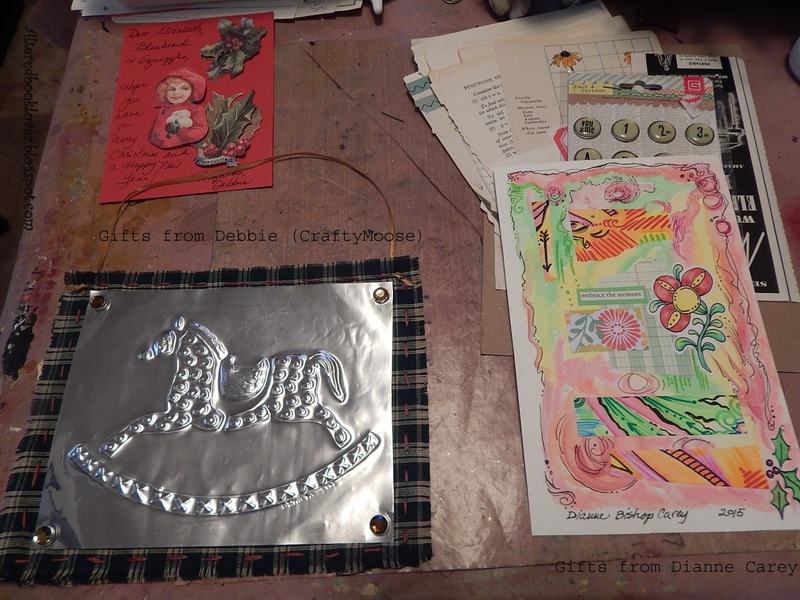 In addition to Debbie's lovely rocking horse, which included hand sewn fabric, she also sent this lovely card to go with it. Dianne's other side is shown on the right, as are the wonderful pages and art supplies she sent me that I can use as collage fodder. Now let's head to Julia's where you can put your desk on display, too! Please don't forget your number if you are playing in WOYWW. You got wonderful presents dear Elizabeth! A pretty grouping of fun things. A nice bright window too. Do you have snow? So far just a lot of rain. A most unusual warm start to winter. Have a great WOYWW day. What lovely items you have on your desk, Elizabeth - so much more interesting than mine was this morning!! I love the big shot of your room - all those lovely little items hung by the window. Thanks for visiting already, and for your compassionate comments. What lovely gifts you got! Lucky girl. I love that rocking horse Elizabeth....you lucky girl. Congrats on #1 always lovely to see gifts from crafty friends. Great friends you have and great taste they have in gifts too. The rocking horse is absolutely gorgeous - what lovely goodies you got and what lovely friends you have! Lucky you to have such good friends. What a lovely collection of gifts you received. And even though you might be in awe of my fabric painters (many years of collecting them), I am in awe of your great friends and your play space which is much bigger than my little space. Have a super day! P.S. : don't forget to enter my giveaway to win a bracelet and earrings jewelry set! Thank you for your visit last week, sorry I didn't return the visit .... was a bit caught up in festivities!!! What a great shot of your room and a stunning rocking horse!! Love the 'wardrobe' above your window - are they cards or just designs? Super idea ..... they would make me happy every time I looked at them. You are so blessed with such wonderful friends! Great gifts! Happy WOYWW! What lovely presents! I know you love rocking horses, so this one is extra special. Wonderful creative gifts from your talented friends E on your neat and tidy desk! Such a neat space! Lovely gifts from some very talented friends! Lovely array of goodies! What a treat to see. Oh I love this view of your desk..taking in all the little dresses, had forgotten about those! Poor Wendy, you're right, she looks the worse for wear, I'll pass on sharing that particular tipple, thank you! The new rocking horse is fab, how clever of that crafty moose. And hey, a tip in..I don't think I realised that you swapped and did them for others. Hmmm. What fun gifts! Love the rocking horse. I can't believe you are number one again. I barely make it to #50! Hugs! Enjoy your lovely gifts, thank you for a glimpse of your work room. Nice presents! I like the page. It is very colourful. Like the doll clothes hanging in the background. Did you make them? that IS a stunning rocking horse! ♥ enjoy! Hi Bleubeard & Elizabeth, What lovely things you have on show. I adore the rocking horse. Can I ask what the little clothes hanging up are for? I enjoyed seeing this different view in your studio and all the lovely gifts you received. The whimsical clothesline with what appear to be dresses for the different months of the year also caught my eye. Blessings! Well, that really is happy mail, huh?! What lovely post to receive...is that rocking horse card made from real metal or foil? It's hard to tell from here...whatever, it's very effective!